A reader left an interesting comment about the Magic Eraser product view that I posted. The comment stated that the Magic Eraser contains formaldehyde; this concerned me, and so I decided to check it out. I responded to the post in the comments section, citing statements made from the Mr. Clean website, but for some reason whenever I try to post the link on the comments page I cannot get the entire link to come up, so I decided to post it again Here. The ingredients in Magic Eraser have been safely and commonly used for many years in a wide range of household products. 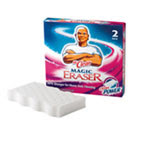 Formaldehyde is not and has never been an ingredient in Magic Eraser. One ingredient in Magic Eraser (formaldehyde-melamine-sodium bisulfite copolymer) contains the word "formaldehyde" in its chemical name. However, this ingredient is not formaldehyde and poses no health or safety risks. (Think of this name like "sodium chloride", which is table salt. Sodium by itself can be dangerous, but sodium chloride - salt - is safe.). Magic Eraser is considered non-toxic. As with any sponge-like product, when swallowed this product may block the gastrointestinal tract. Therefore, we do advise to keep this product out of the reach of children and pets to avoid accidental ingestion - it is not a toy. It is possible that formaldehyde may be present in minute, trace amounts as a result of the manufacturing process. Even then, the amount present is significantly lower than standards established by governmental agencies and trade associations, and is actually less than what is found in indoor air. In fact, no ingredients in Magic Eraser are subject to any health-related labeling laws in North America or in the European Union." I wouldn't call it backpeadaling. They just had to respond to a this broadcast that was put out. If there was truly a problem with the product the proper government agencies would be all over it, and it there would be a product recall or at least a big story in the media about. There statements simply clarify the fact that the there is the word "formaldehyde" in one of the chemicals, but it is not actual formaldehyde like we think of it.